Do your kids have an interest in technology, building robots, coding, creating video games, building websites, photography, digital video, or making amazing Minecraft worlds? Then they will love the summer programs from Fleming Tech Camps at Sidwell Friends School. To achieve our mission, Fleming Tech Camps partner with schools, museums, universities and summer camps to help those organizations offer state-of-the-art technology programs. This summer, Sidwell Friends School will partner with Fleming Tech Camps to host fourteen of our amazing summer camp programs. Parents can enroll their campers in up to ten weeks of Tech Camp at Sidwell Friends School. For families looking for multiple weeks of summer camp programming Sidwell Friends School can offer your family amazing flexibility. You can enroll your child into one, or more, weeks of Fleming Tech Camps and also enroll them into a wide range of other camping programs, including Sidwell Friends School‘s traditional day camps. Summer camp programs atSidwell Friends School run from 9AM to 3PM. However, Sidwell Friends School also offers AM and PM extended day options for parents that need addition flexibility. In the summer of 2019, Sidwell Friends School and Fleming Tech Camps will offer ten weeks of programs, with two technology programs each week. 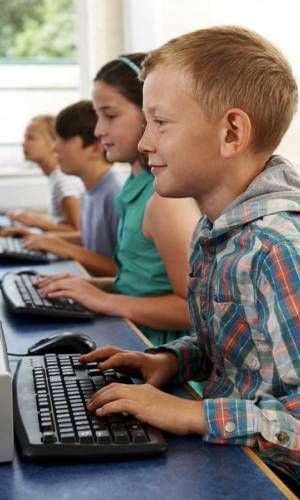 Throughout the summer, we will offer technology camps for rising 1st grade through 8th graders. The focus of Web Design 4 Kids is on learning how to design a super cool website, without writing HTML or other code. Campers will learn the basics of web design using WSIWIG design tools and will also have an introduction to graphic design software. By the last day of camp, campers will have designed a series of web pages that reflect their personal interests and hobbies. No prior experience necessary. All skills levels welcome.